Abstract: This paper presents, AmbiKraf, a non-emissive fabric display that subtly animates patterns on common fabrics. We use thermochromic inks and peltier semiconductor elements to achieve this technology. With this technology we have produced numerous prototypes from animated wall paintings to pixilated fabric displays. The ability of this technology to subtly and ubiquitously change the color of the fabric itself has made us able to merge different fields and technologies with AmbiKraf. In addition, with an animated room divider screen, Ambikraf merged its technology with Japanese Byobu art to tighten the gap between traditional arts and contemporary technologies. Through this AmbiKraf Byobu art installation and other installations, we discuss the impact of this technology as a ubiquitous fabric display. With focus to improvements of some limitations of the existing system, we present our future vision that enables us to merge this technology into more applications fields thus making this technology a platform for ubiquitous interactions on our daily peripherals. Our Poetry Mix Up project was exhibited in downtown Seoul at the SK Telecom center. People could tweet a message and it would be converted to a poem. You can try it for yourself. Send a tweet to @poetrymixup and it will be converted to a poem. Mirroring is the behavior in which one person copies another person usually while in social interaction with them and is one of the most powerful ways to build rapport quickly. When meeting someone for the first time, mirroring their seating position, posture, body angle, gestures, expressions and tone of voice are some useful examples of doing this. Before long, your partner will start to feel that there’s something about you they like and they may even describe you as ‘easy to be with’. Lighting and scents have shown to have an important role in reinforcing special perception, activity and mood setting, emotion, judgments, and even social relationship. 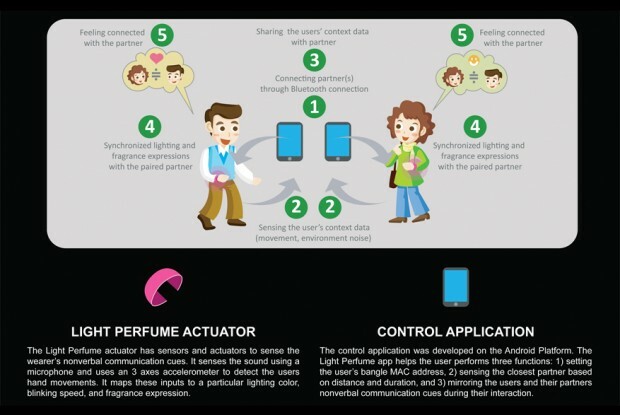 Light Perfume was designed to help people mirror each other using visual and olfactory outputs to strengthen a user’s psychological bond with the partner. 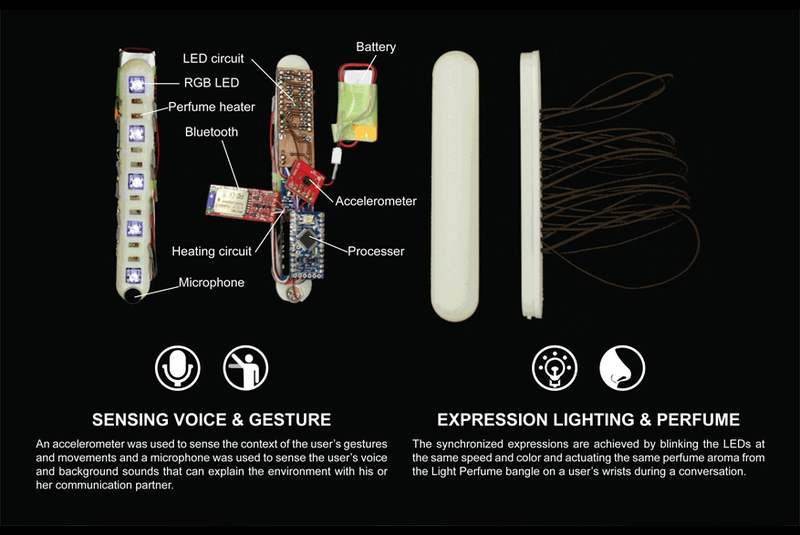 We do this by synchronizing the speed and blinking color of LEDs and emit the same perfume scent from each person’s device during a face-to-face conversation. 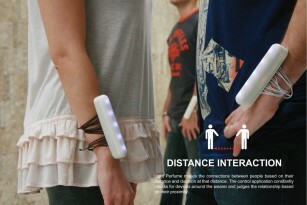 The outputs are chosen based on inputs from the user’s environment such as noise levels and expressive body gestures. 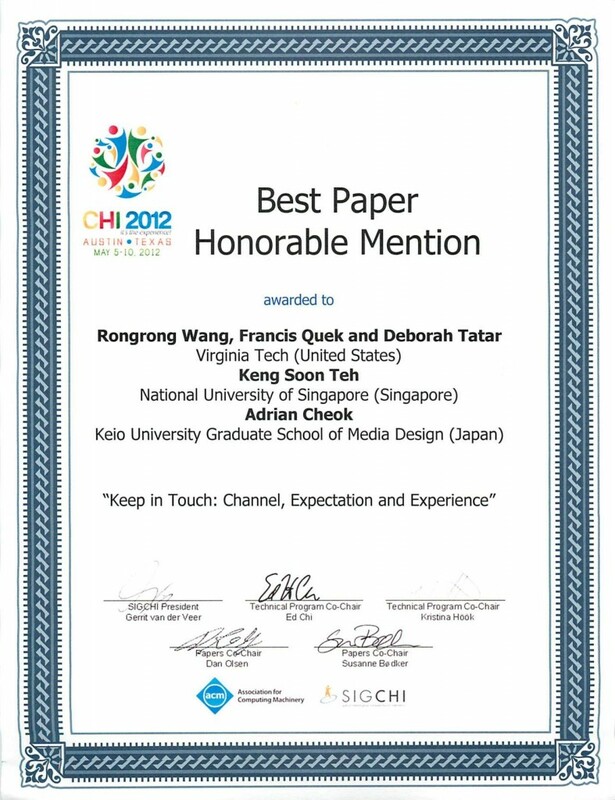 Award at CHI 2012 for our paper “Keep in Touch: Channel, Expectation and Experience”. It is the academic paper for the Huggy Pajama project. Huggy Pajama paper awarded “Honorable Mention” at CHI 2012 Conference. Contribution & Benefit: Describes a remote touch study, showing communicative touch accompanied by speech can significantly influence people’s sense of connectedness. 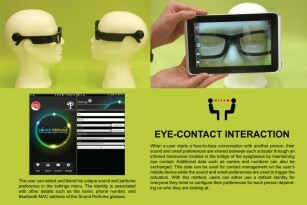 Identifies perception of communication intention as an important factor in touch communication design. Face-to-face communication remains the most powerful human interaction. In this day and age, people have become dependent on electronic devices to communicate with others leading to many interpersonal difficulties and miscommunications in today’s society. We believe that face-to-face communication remains the most powerful human interaction and these devices can never fully replace the intimacy and immediacy of people conversing in the same room. If society loses its physical aspect, many of the subtle benefits that go along with physical face-to-face contact will also be lost. Much of communication is done non-verbally and emotions can easily be transferred from person to person without the utterance of a single word. 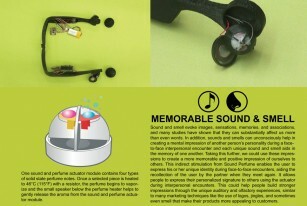 Sound Perfume is our attempt to encourage face-to-face communication by making it more emotional and memorable. We do this by augmenting a person’s experience through additional auditory and olfactory stimuli during social encounters. 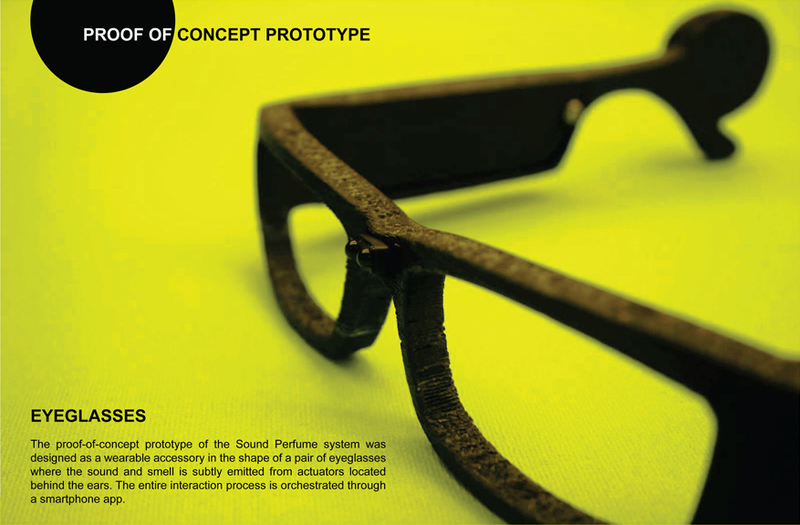 We designed wearable actuators that provide each user the ability to handcraft their sound and scent identity. This identity is then transferred to another system when two people meet, using a unique technique known as eye contact interaction, stimulating each person with their partners sound and smell preference. We have developed a working prototype designed in the shape of a pair of eyeglasses that help us demonstrate the interaction techniques and actuations. We also present an advanced design that is minimalistic in its use of components. Mirroring is the behavior in which one person copies another person usually while in social interaction with them and is one of the most powerful ways to build rapport quickly. When meeting someone for the first time, mirroring their seating position, posture, body angle, gestures, expressions and tone of voice are some useful examples of doing this. Before long, your partner will start to feel that there’s something about you they like and they may even describe you as ‘easy to interact with’. This is because they see themselves reflected in you. Light Perfume was designed in a bangle in order to directly stimulate a user’s eyes and unobtrusively stimulate a user’s nose from the wrist. It also is a perfect location for sensors that detect acceleration of the arms and sound from the surrounding area. The aroma is created by heating solid perfume and emitted by the movement of the wearer’s conscious and subconscious body gestures during a conversation. Congratulations to Ph.D student Wei Jun (@weijun924) for having a full paper accepted in the journal IEEE Transactions of Consumer Electronics! The abstract of our paper is below. We introduce Huggy Pajama, a system for remote hugging targeted at parent-child communication. Expanding on experimentation and research shared in a previously published paper; in this paper we focus on development breakthroughs regarding the wearable output and independently controlled multiple air-actuated modules found in the mobile wearable jacket subsystem. We include practical data in designing the wearable and mobile version of Huggy Pajama with embedded electronic and pneumatic devices, as well as offer results from a user study, from which we find that in order to deliver a mediated hug of high fidelity, the system needs to be capable of actuating hugs with a wide and differing range of pressure. Finally, we also present results from this study that show an overall positive emotional affect in the use of the new and improved version of the Huggy Pajama system. Tsai, Zhenling ; Koh, Jeffrey T.K.V. ; Cheok, Adrian D.
I am glad to be part of a university that develops crazy ideas. In the latest crazy research here is a screen which is used for interactive kissing. By sensing the distance between the user and the display, this photo of a person reacts when kissed. 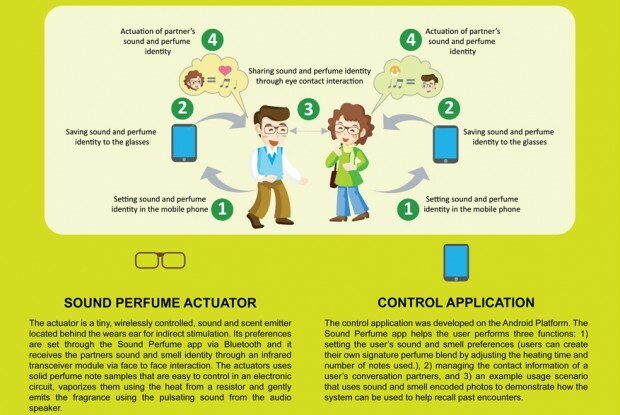 This system is currently under development by a research group at Keio University and they are also considering how to utilize this system in a commercial context. From now on, the researchers plan to develop an iPad application. For this, they’re considering other sensing methods, such as using image recognition via the camera, or using a light sensor that reacts to the shadows created when the user approaches. Test_Lab: Smell This! Witness the decomposition of Chanel No. 5, sniff out a partner, taste with your nostrils, and more treats for the nose. This lab by Maki Ueda sounds very interesting. Try to join if you are in Rotterdam or on line with the streaming. Maki Ueda taught a guest lecture in my class at Keio University and I have a strong appreciation of her work and philosophy. I agree with her that smell is a vital human communication. More on the event: “Would you rather give up your sense of smell or your smartphone? A recent worldwide study conducted among youths aged 16 – 22 found that more than half of them would chose technology over their own sense of smell. What good is a nose anyway when all your friends, entertainment and sources of information are online? This edition of Test_Lab will reveal that your sense of smell might actually be the best reason to stay connected to the physical world. While the communication industry is fixated on visual and aural communication, it is the work of pioneering olfactory artists that points out the significance and potential of communication through smell. In this edition of V2_’s Test_Lab, Maki Ueda performs a live experiment in decomposing the legendary fragrance Chanel No. 5, Susana Soares shows you how to sniff out a partner, and one of the world’s greatest scent experts, Sissel Tolaas, lets you taste with your nostrils. Art-historian Caro Verbeek kicks off the evening with a talk on smelly art, accompanied by a genuine AJ (Aroma Jockey). Smell all of this at Test_Lab! Another wonderful and weird work from Japanese media artist Daito Manabe. By using electrodes one can moves one’s face and control another person’s face. I really like the use of haptics for affective communication. This is a comment on how we can often wish we can influence other people’s mood and therefore bodies directly. One of our KMD students, Kensuke Fujishiro, worked on this project. It is a beautiful work which I think is a wonderful analogy of the importance of physicality and being analog even in our modern computer world. It combines the light inside a physical ball with a track and all connected and controlled wirelessly by a computer. Somehow the physicality and analog nature is so much more beautiful than seeing a particle cloud on a computer screen. Inventor. Professor of Pervasive Computing, City University London. We are honored to announce that Professor Adrian David Cheok has been appointed Adjunct Professor of Artificial Intelligence (AI) at Raffles University Iskandar (RUI)!!! See and Try our Kissenger at Science Gallery DUBLIN! WE ARE PROUD TO ANNOUNCE THAT PROFESSOR ADRIAN DAVID CHEOK is Professor scheduled for new University i-University Tokyo https://www.i-u.ac.jp/ SEE YOU SOON IN TOKYO!! !